Oxygenate the right way with the Oxygenation Wand from Anvil Brewing! This heavy duty stainless steel wand with integral barb measures 24 in. 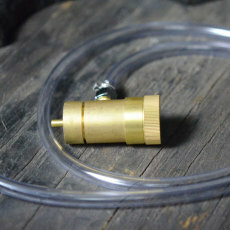 long and is perfect for adding oxygen to your wort once cooling is complete. It has a sintered stainless steel stone at the bottom so oxygen can bubble through your wort, creating the optimal environment for yeast to thrive, multiply and ferment! Easy to sanitize, this wand is FDA and NSF approved for food contact. This oxygenation kit also comes with an oxygen regulator that can be used with disposable oxygen tanks that can be found at the hardware store. To use, simply soak the hose and wand in sanitizer, connect the flare end of the hose to the included oxygen regulator, place the wand in the bottom of the fermenter, and gradually increase the flow of the regulator until bubbles are visible. Slowly stir for 1 minute per 5 to 10 gallon batch of beer, then turn the regulator off. Your wort is then oxygenated! Simply sanitize and dry thoroughly, and you will be ready for the next use. 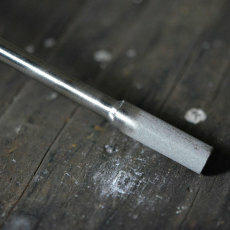 Get better results from your yeast with proper oxygenation with the Oxygenation Wand from Anvil! Great price, easy to use and no more shaking. Not to mention really great customer support. Owner Response: Thanks, Joe for the review! Glad you're loving the Oxygenation Kit. Cheers!